A drone photographic survey was undertaken over Leckhampton Hill and Charlton Kings Common in April 2018. The resulting 2-D photomosaic is shown below. Unfortunately we can only display a low resolution image here but we do have much better high-resolution images that allow us to see things in much more detail. FOLK is now using this information to map out and record various features on the site, e.g. where gorse exits, and is using this to improve the management and planning of work on the site. 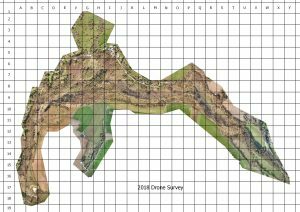 The drone survey and data collation was performed by Steady Hawk (http://steadyhawk.com/) from Bristol under contract to Cheltenham Borough Council with part funding by FOLK.